ITALIAN STREET PHOTO FESTIVAL 2019 TO START! Months of work and we arrived at the presentation of the program of the second edition of the Italian Street Photo Festival. 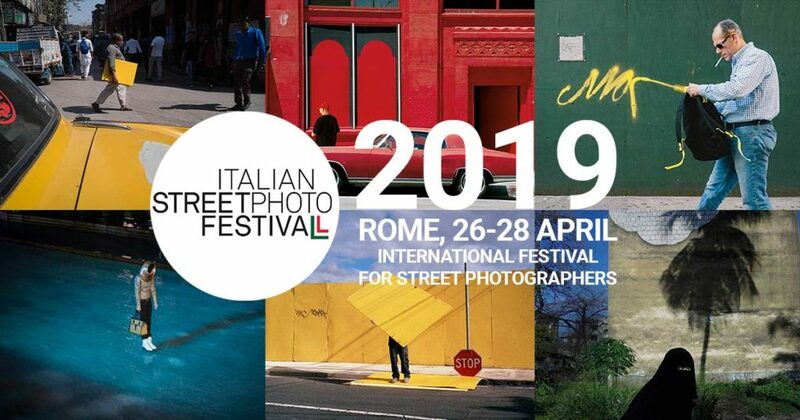 ISPF 2018 was the first international street photography festival in Italy (in April 2018) and come back for the 2019 edition, still full of news and guests. This year the Italian Maestro Franco Fontana and the Magnum Nikos Economopoulos will be the two great guests who will hold the festival’s workshops. As last year, many contemporary street photography guests will participate, as judges or to hold talks, photowalks, portfolio reviews, etc. David Gibson, Tavepong Pratoomwong, Jesse Marlow, Julie Hrudova, Stefano Mirabella, Alex Liverani, Jonathan Higbee, Gabi Ben Avraham, Elisa Tomaselli, Stefano Lista, Federico Arcangeli, Benedetta Falugi, Umberto Verdoliva, Pau Buscato, Julia Coddington, Dmitris Makrygiannakis, Tatsuo Suzuki and I. The street photography contests are always three and with very rich prizes also this edition: single photo, series and photo by phone. About the contest, I will be one of the judges of the contest “single photo” and I invite you to send your street photos!